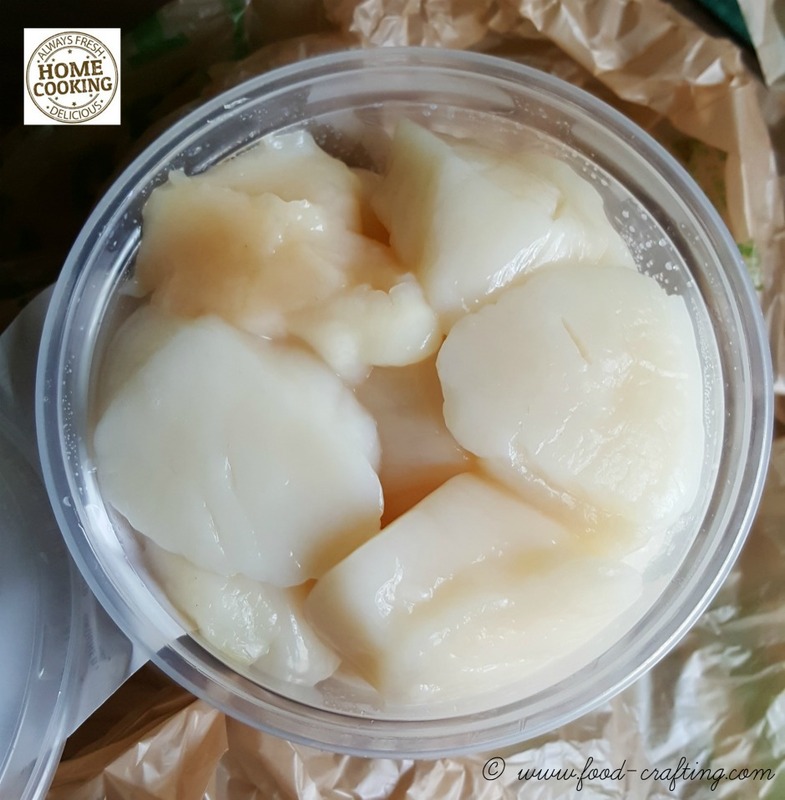 Easy Pan Seared Sea Scallops – During a quick trip to the supermarket earlier this week, I came across fresh sea scallops at the seafood counter. I usually buy them three or four at a time for Mom but these scallops were so fresh and reasonably priced that I bought enough to make dinner for two. Set a pretty table! Serve the sea scallops in their own shells! Sea scallops are the perfect choice because you can prepare them in so many different ways. Even on the grill! At the seafood counter, you will find fresh and frozen scallops throughout the year but they are at their freshest and best tasting during the winter months. If you decide to buy frozen scallops, make sure they were flash frozen and are practically free of any liquor. Sea scallops are good for you too! They contain good, quality protein, very little fat and plenty of minerals. Scallops are versatile as well – you can add them to soups, rich chowders and main dishes. Cook in a court bouillon (recipe below) and once cooled, you can prepare appetizers or add them to salads. These easy pan seared sea scallops are quick to prepare but every so often, I take the time to prepare them in a decadent but very easy Coquilles St.Jacques recipe to serve in their beautiful shells. 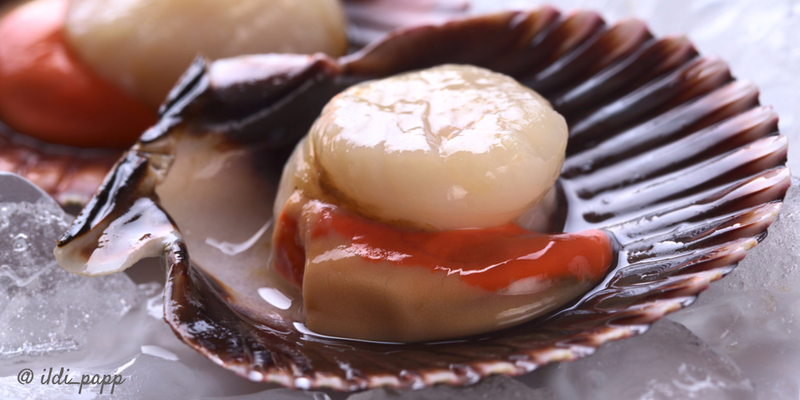 For Coquilles St. Jacques, the scallops do need to be poached first. It’s true. Dinner was planned for two. The only problem is that I ended up eating dinner alone. That did not stop me from preparing easy pan seared sea scallops (Pétoncles poêlés) – seared in brown butter (au beurre noir). There are so many scrumptious recipes for sea scallops that it is difficult at times to pick just one. But, in my mind, simple is best when the scallops are super fresh. Don’t get me wrong. You want them super fresh at all times but when the recipe is as basic as these easy pan seared scallops, you want them to be “right out of the ocean” fresh! Cote Bretagne – FranceI can remember a Réveillon in 1987 when my cousin pitched a fit typical of a resident of Brittany where it relates to the freshness quotient of seafood. The shellfish he brought from the coast was not as “fresh” as he wanted it to be. Allow me to add that we never held it against him that it was less than six hours out of ice- cold Atlantic waters. Unfortunately, the dinner table was a few hundred miles away from the fishing docks. Back to the seared sea scallops. I can’t even say that I followed a recipe! Jumbo sea scallops simply prepared are always the best! These are pan seared in a little butter, then topped with herbs, garlic, and capers. Dry the sea scallops on paper towels. Set aside. Season with white pepper. 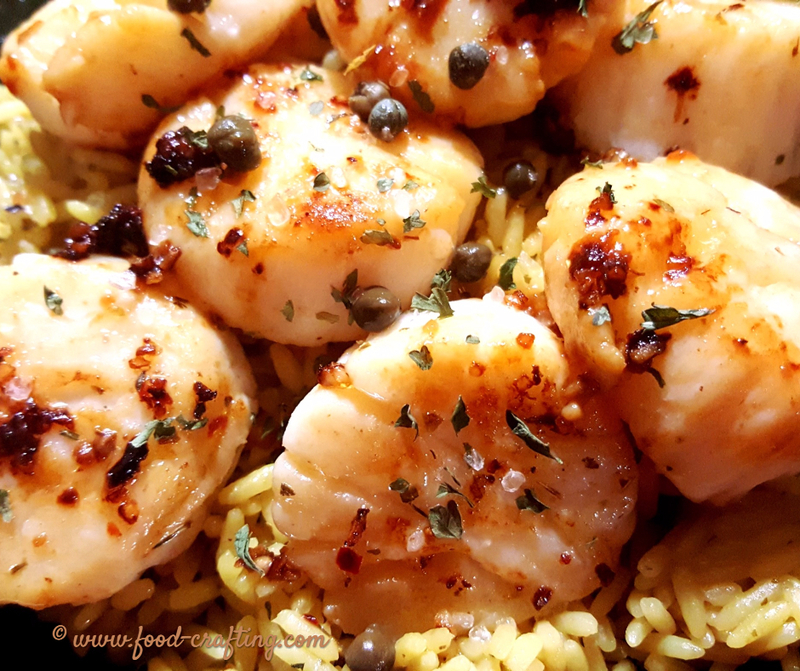 It’s impossible to remove the salt from the capers so resist the urge to salt the scallops. If you do, do so with a light hand. When you are sure the scallops are dry, heat a large frying pan over medium high heat. Add the olive oil. When the olive is hot, add the butter. Wait until the butter begins to take on a golden color and foam before carefully adding the scallops. Lay them flat in the pan, in a signle layer. Sauté for 3 to 5 minutes, turning the scallops to the other side when one side has become golden brown. Remove to a warm plate while you prepare the sauce. Lower the heat, and to the pan – add the garlic and parsley. Stir quickly but do not allow the garlic to burn. After a minute or so, add the white wine or vermouth and a tablespoon of butter. Stir well to combine and pour over the scallops. Serve them immediately over rice or pasta. Serve over butter and garlic rice or spinach linguine. A green salad or steamed squash and you have a spectacular meal! Oh, and don’t forget to serve white wine. There is, however, one trick that will make this type of easy pan seared sea scallops dish come out perfectly every time. Well… maybe two tricks. ▶️The scallops must be “”dried” of all liquor on paper towels before you sauté them. ▶️The frying pan has to be super hot and large enough to hold the scallops in a single layer. Pick a pan that will take the heat – in other words, a pan that will not warp when it reaches a certain temperature. It’s not pretty to have hot butter (any hot oil or grease for that matter) splatter out of the pan unexpectedly. Been there, done that. The result? Burns all over my forearms and up into my neck and my face. So I now wear my long sleeved apron or shirt when frying at high temperatures – and I use a large splatter shield ! A 13 inch wide splatter shield will over even your largest frying pan. They are easy clean stainless steel, go in the dishwasher and never rust! In my kitchen cabinet, this hook-in spatter shield tops them all because it does the ultimate job of protecting me from burns. I even have this Cuisinart shield that does double duty as a frying pan lid! A frying pan splatter shield has been a more than welcome addition in my kitchen cabinets. 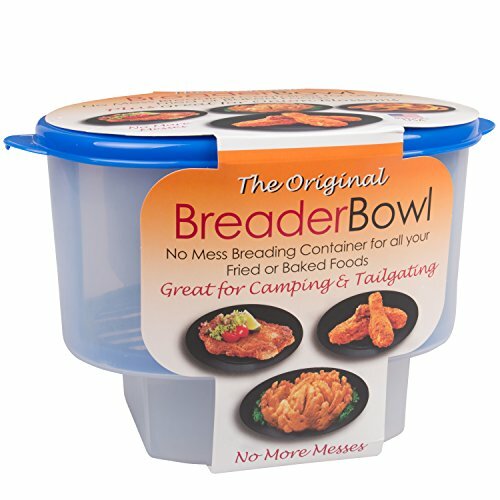 I have them in several sizes but a large splatter shield comes in handy when frying everything from eggs to chicken or such delicacies as beer battered [popup_product]soft shell crabs[/popup_product] (dry these on a paper towel as they are notorious at splattering oil when the heat hits a pocket of liquid). There is nothing worse than being on the receiving end of mini explosions of hot fat. A cast iron frying pan is perfect for this simple recipe. Oh, and don’t be afraid to use butter. Real butter! Splurge this weekend. 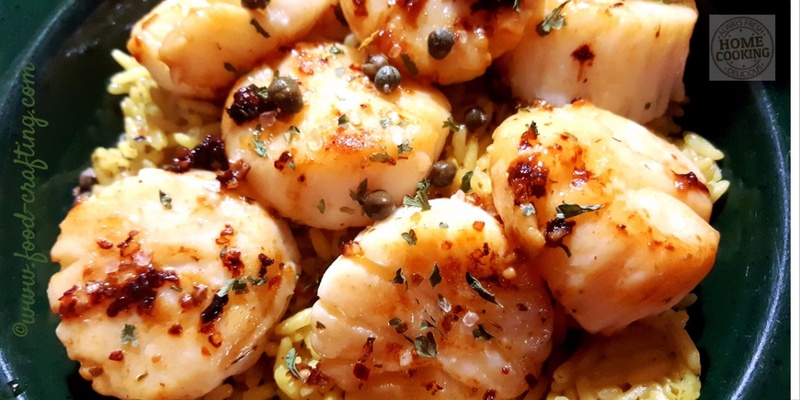 Make easy pan seared sea scallops for dinner. Wondering about what wine to drink with scallops? Chablis tastes great with seared scallops but so does an Alsatian white. Of course, champagne works with everything but that’s my humble opinion! Poach fresh sea scallops in court bouillon to add a layer of flavor to cold cooked scallops. Works well with other seafood selections. 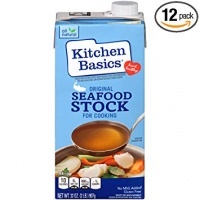 1 to 2 cups of Holland House® white cooking wine or white Sauterne. 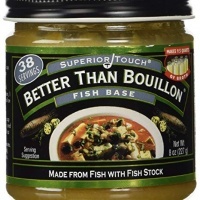 To make the court bouillon "semi-homemade" , buy a container of seafood stock and add seasonings to taste. You can omit the wine and use different spices too! In a deep sauté pan, add all the above ingredients together. Bring to a boil and reduce to a simmer, allowing the liquid to simmer for about 20 minutes. Strain and set aside until ready to use. When ready to poach the raw scallops (they are translucent when raw), add the poaching liquid to a large pan - large enough to hold all the scallops in a single layer. Bring the poaching liquid to a simmer THEN add the scallops in a single layer. Simmer for about 2 minutes turning them over if needed, until they are cooked through. They will turn a milky white. Remove them from the poaching liquid with a skimmer and drain on a paper towel. Once cooled, you can cut them in pieces to top a salad or use them instead of shrimp in an appetizer. 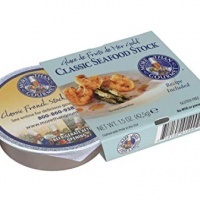 Looking for organic seafood? Here is a source for the finest in wild seafood. 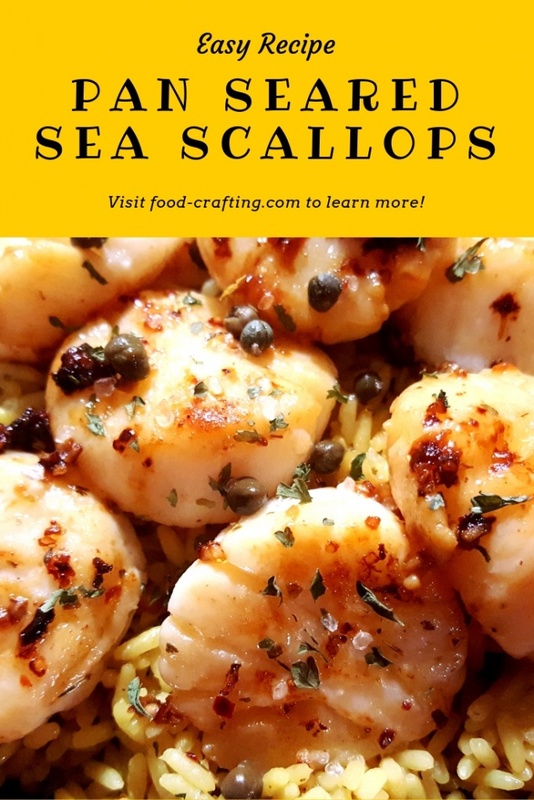 You will also find a long list of scrumptious recipes for sea scallops!